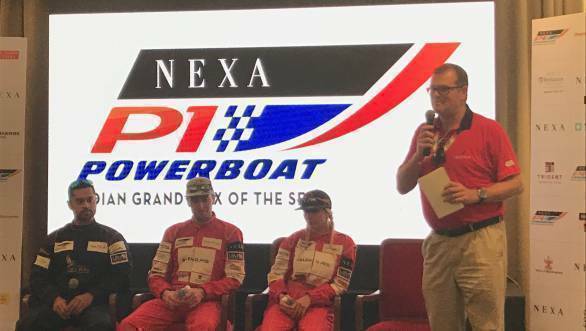 The 2017 Nexa P1 Powerboat Indian Grand Prix of the Seas began today at Mumbai's Marine Drive with the qualifying rounds. Each boat got two laps to set the quickest time possible, and the fastest team will take pole position in Race 1 on Saturday. That team is Sam Coleman and Daisy Coleman from the Baleno RS Boosterjets with a best time of 2m25.73s. Missing pole by just 100th of a second are James Norvill and Christian Parsons-Young from team Money on Mobile Marlins. John Donnelly and Kevin Burdock of team Mirchi Mavericks have taken P3 with 2m26.63s. Indian competitors Gaurav Gill and CS Santosh will start seventh and ninth from the grid, respectively. Santosh's quickest time around the 5.2km course was 2m31.54s, while Gill managed 2m30.6s. Day 2 feature two races, one based on the qualifying results and the other on a reverse grid based on the results of Race 1.